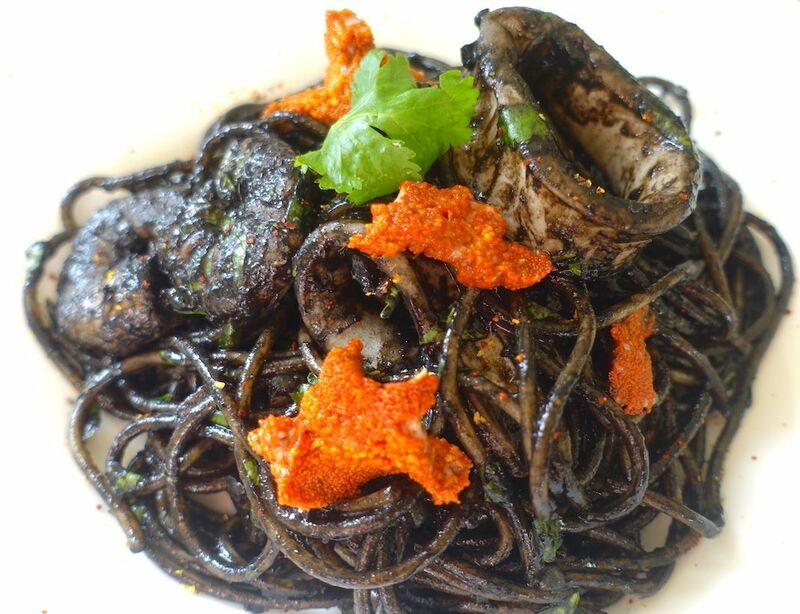 This black seafood spaghetti recipe is easy to prepare, looks beautiful on the plate and tastes even better. The squid ink gives an intense black colour and adds marine flavour, while the sea urchin gives a creamy marine finish. The spices and chilli are mostly present in the end. Finding fresh raw seafood can sometimes be challenging. Sea urchins and squid ink are not available everywhere. 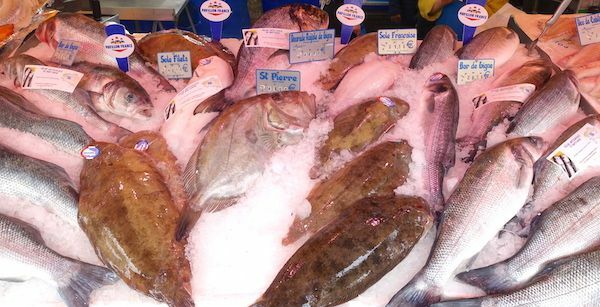 In Paris, it’s easy to find the ingredients in the fresh market. Some supermarkets also have good fishmongers. In Miami, I believe it would also be a challenge. Supermarkets, even the most expensive don’t necessarily source everything. The fresh markets that I’ve seen there sell mostly produce and street food. 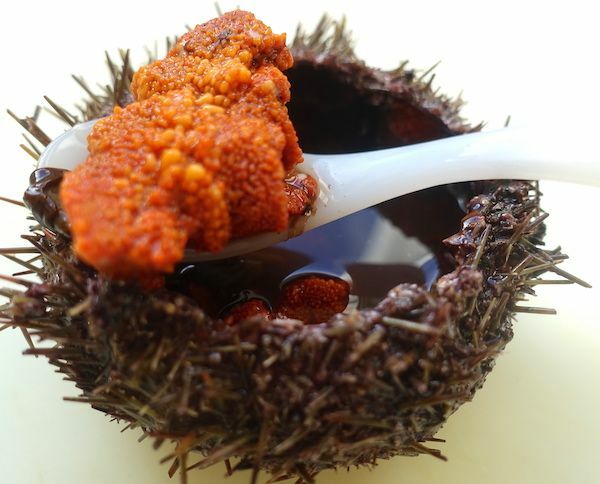 In Lima, due to the proximity to the Pacific Ocean, you can find great fish and seafood however, finding sea urchins is quite a challenge. 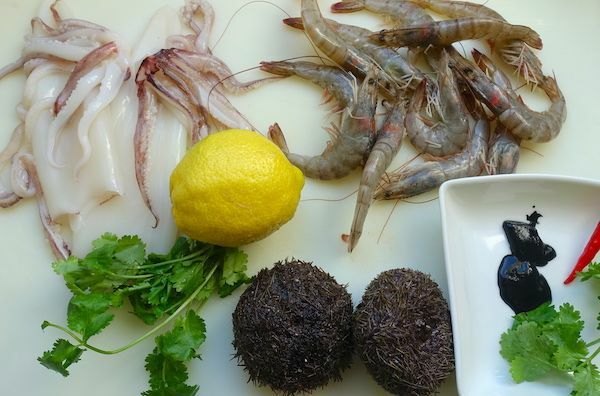 In London, small fishmongers can order sea urchins for you and source fresh raw prawns and squid, including squid ink. Big outlets don’t sell sea urchins because massively picking them from the ocean damages the coral reef therefore, it’s not done in big quantities. For the same reason, local scallops are available but expensive because they are hand picked by divers. Is it easy to find fresh raw seafood, sea urchins and squid ink where you live? Share your shopping tips! 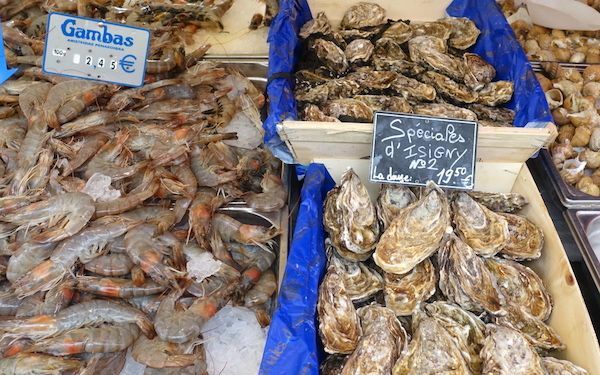 One of the many advantages of life in Paris, and actually in any French city, is the availability of fresh markets several days a week. Every neighbourhood has a market two or three times a week. For me, Sunday morning was fresh food shopping day. A loud busy experience that awakens anyone better than coffee, plus a delight to the senses. The French know how to beautifully display their products. 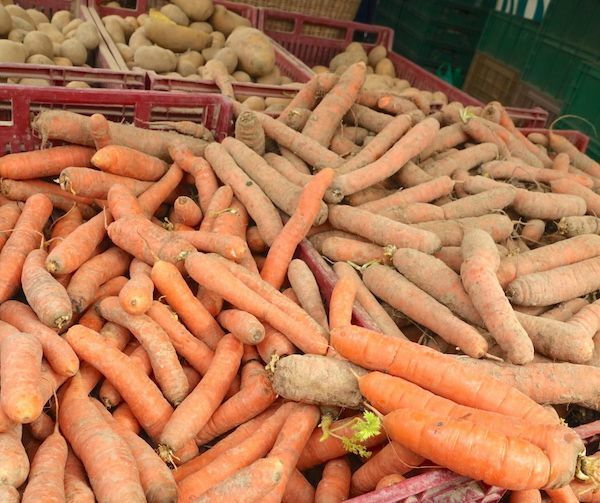 Produce are not necessarily spotless and shiny, but look natural, fresh and organic. 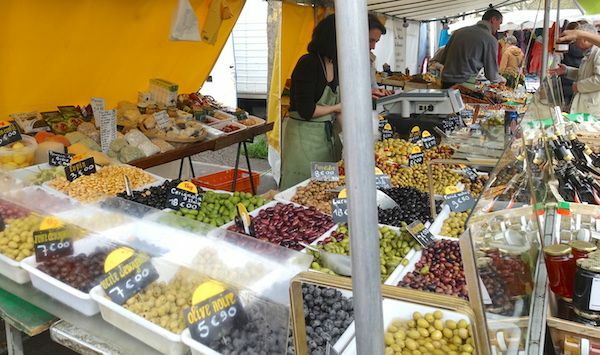 In these markets you meet farmers, knowledgeable fishmongers, experienced cheesemongers, professional bakers, butchers, and avid suppliers of the freshest produce and much more. Some weekends, I had lunch in the market; fresh oysters and sea urchins with lemon, accompanied by a small glass of white wine. It was an unforgettable experience to stand in the middle of the hustle and bustle, under the sun, feeling like a local and being photographed by tourists. 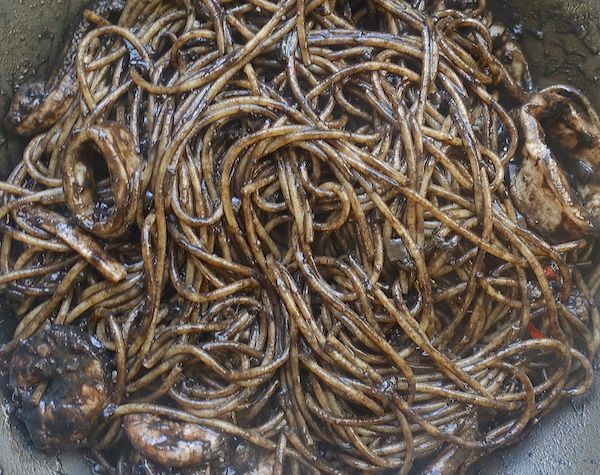 One Sunday morning, while walking home with my trolley market bag full of fresh goodies for the week, I had a craving for black seafood spaghetti. The idea of this dish brought me back to sunny Spain and those amazing black paella, fideuà, and spaghetti. I headed to the kitchen and created this recipe with my touch of spices, chilli, coriander, and sea urchin, which is the cherry on the top. It gives a spectacular creamy, marine flavour. The funny thing is that it looks complicated and long to make, but it isn’t. 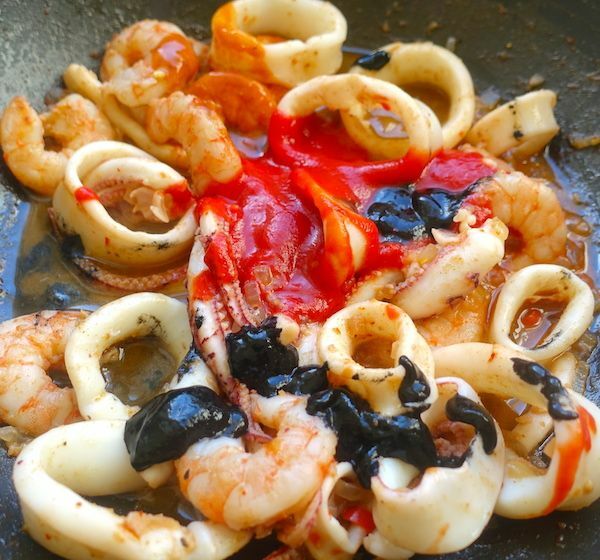 The seafood cooks very quickly, the pasta needs eight minutes to be al dente, and if you follow the instructions step by step, it won’t be long before you are indulging in marine goodness with a spicy aftertaste. Peel garlic cloves, remove the germ and crush. Rinse and chop chilli. Keep seeds. Rinse, dry and chop leaves of coriander to make two tablespoons. 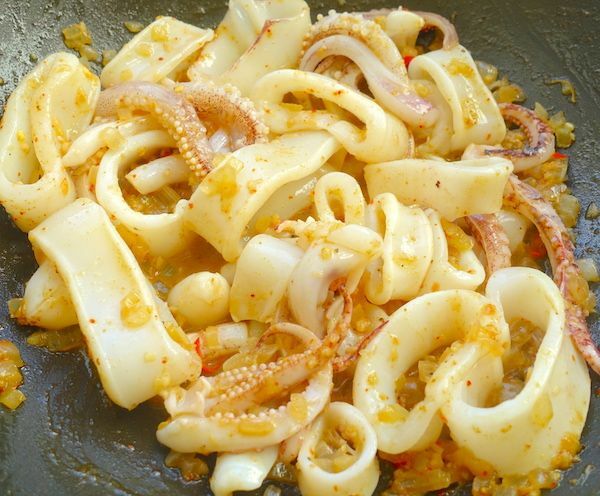 Rinse, clean and cut squid in rinds of about one centimetre wide. 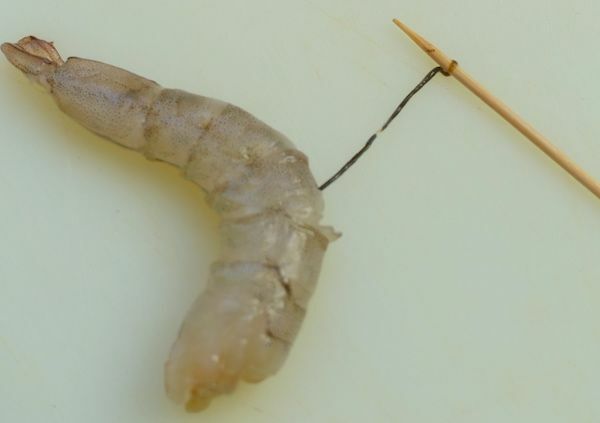 Remove the head of the prawns, reserve the coral, peel prawns and with a toothpick remove the intestine. Filter coral through a fine strainer. Remember that the coral has a lot of flavour so, use it and don’t discard it. 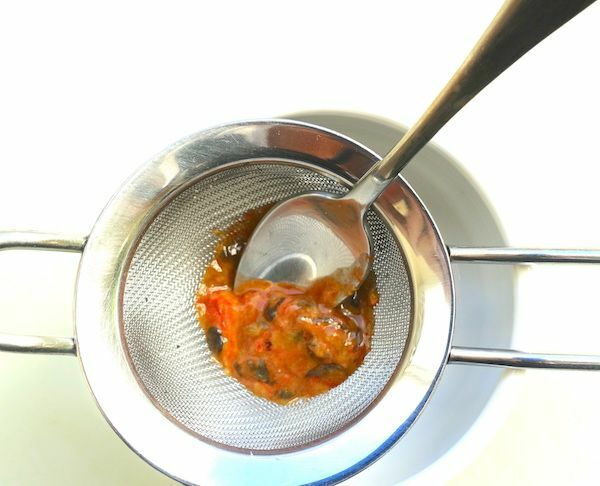 Dilute tomato paste in two tablespoons of water. 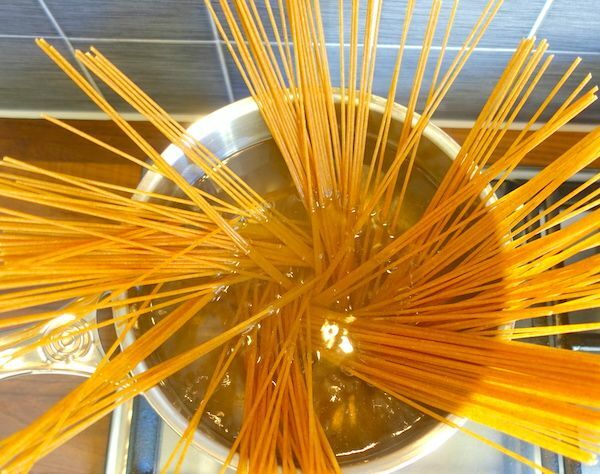 Bring water to a boil in a pot, add a generous pinch of coarse sea salt and cook spaghetti for eight minutes. Strain. In a big pan (make sure you’ll have enough space to add the cooked pasta and mix thoroughly) heat olive oil in medium-low heat, add onion, season with salt and pepper and cook until translucent. Add garlic, cumin, cayenne pepper, chilli and mix with the onion. Add white wine, reduce heat to low and let the alcohol evaporate. This should take about 8-10 minutes. Remember that it’s the alcohol that needs to evaporate, not the wine. Your sense of smell will be your guide. 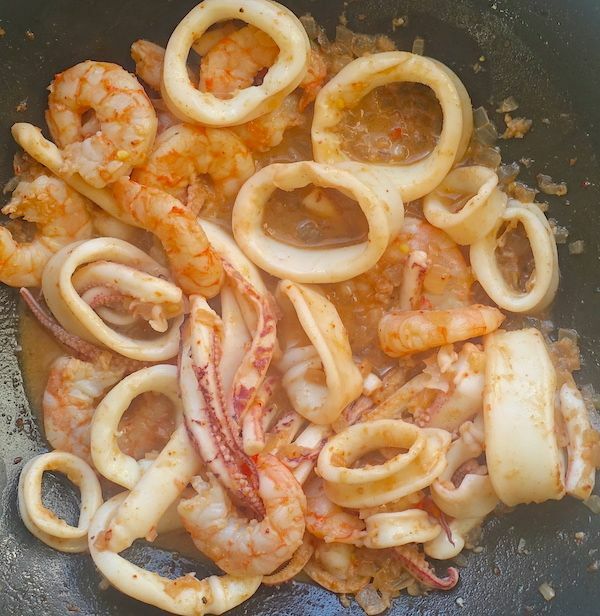 Add squid rinds, mix and cook while the alcohol from the wine is still evaporating. Add prawns and cook until they become pink. Add diluted tomato paste, squid ink and prawn coral. Mix well. Add cooked spaghetti (al dente) and mix delicately making sure the pasta is completely covered by the seafood mix and juices. Remove from the heat, add coriander and sea urchin. Mix one more time before serving so the sea urchin breaks and adds flavour. 5. The cherry on the top that will add even more flavour! Sea urchin. This dish goes very well with dry white wine like a Sauvignon Blanc or a dry Pinot Grigio, as well as a light pink rose wine, preferably from the southern French Provence region. Enjoy and share your thoughts and feedback in the comment section. Don’t forget to share your tips on where to get fresh seafood in your local area. That looks wonderful.! The Sea Urchin makes it so special! I’m going to make this recipe on Sunday . 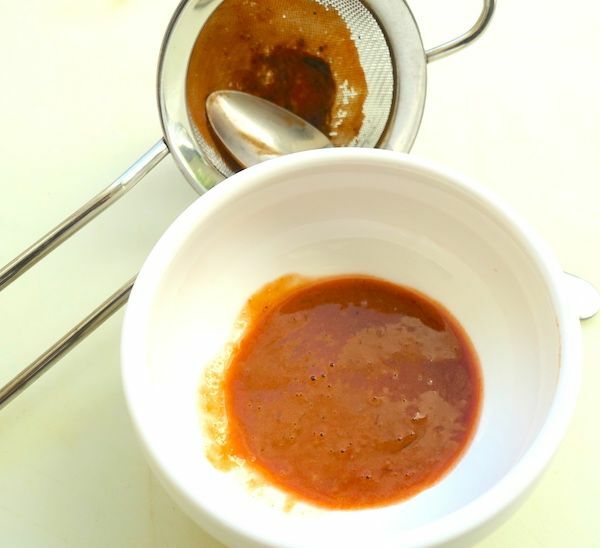 Where did you manage to get the sea urchins from or can I do without them in the recipe?